Once the woolly worm has found its home for the winter, it will create a natural organic antifreeze that protects the interior of its cells. Everything else will freeze, but the woolly worm will still survive. The antifreeze protects the creature in freezing temperatures that can dip as low as –90 degrees Fahrenheit. The wooly worm is also protected by shelter. It chooses its places to hide wisely. It crawls under logs, boulders, boards, rocks, and other dark places. 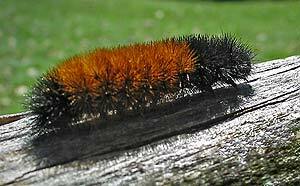 The woolly worm will remain in its “frozen” state until May, when it will emerge as a brilliantly colored moth. Prior to settling in for the winter, the woolly worm will survive by eating a variety of plants such as cabbage, spinach, grass, and clover. And to protect itself from predators, the woolly worm will curl up into a ball, exposing only its bristles, which can be quite irritating to the skin.